As a Jamaican, I’m compelled to express and experience a time and person in history, from the African Diaspora within different culture in another part of the world through this artist and creative journey. Highlighting from 1920’s Santa Monica's community of color: their lives, places and events. From the grave of the first known black surfer Nick Gabaldon who lived in Santa Monica, Califonia 90404 surf in Malibu's Surfer Beach. A reenactment of a 12 miles journey by land and sea will resurrect and relive a moment in time, through the Arts. My inspiration to make aware and tell stories of my people thought-out the African diaspora and celebrate their resilience and passion to overcome adversity, which makes me proud within my skin and know that I am standing on their shoulders. As multi-media interdisciplinary artist, whose work takes place at the intersection of construction and theatricality as a; painter, sculptor, ceramicist, poet, playwright, video artist, sculptor, assemblage and installation artist. I am drawn traditional of shattered Africans. I allow my, process and research to inform and decide the direction of the actual work for this exhibition. From this project I hope learn about the Tongva people and their tradition, the Ink well a beach a segregated beach for people of color and where black people felt comfortable and other minority people of Santa Monica through the years. 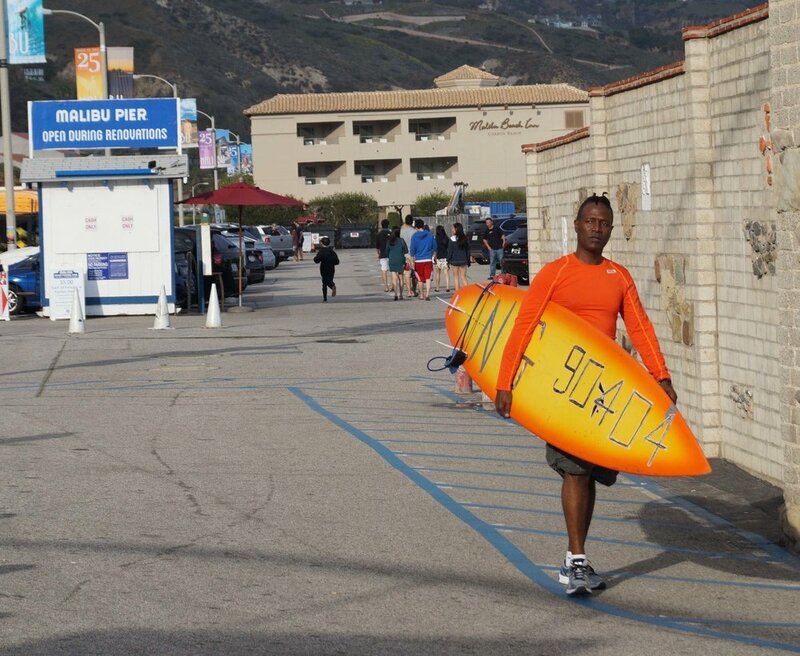 The fact that Nick Gabaldon was of both African-American and Latino heritage, found a community outside of his to pursue of his passion, SURFING at the Surf rider beach in Malibu from Santa Monica. Today decade’s later we are still challenged to bridge and build community where there is shift of humanity and Nick’s teachings of looking beyond the horizon are an inspiration.